With its huge hooks, slick, layered productions and musical prowess, it became the new, widely accepted soundtrack to not only mainstream USA, but the world. Suddenly, rock wasn’t all about being loud. Now, songwriting, performance and skill were front and center, not least in terms of drummers. Players like Jeff Porcaro, Bernard Purdie and Steve Gadd would go on to inspire a whole new generation of drummers around the world. This collection of grooves takes off in the wake of this era – with a strong foothold in classic rock, but with that “session musician” quality that often signifies the genre. Expect sturdy, timeless grooves with edge, nuance and finesse. 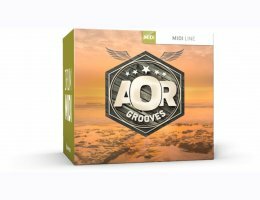 This MIDI pack gives you the perfect foundation to any rock track where you want the drums to have attitude – without being overpowering.